Moyse's Hall Museum, Cornhill, Bury St Edmunds. For almost a thousand years Moyse's Hall has looked out over the Market Place of Bury St Edmunds in Suffolk. It has seen many changes since it was built in 1180 and provides an excellent setting in which to trace the unfolding story of West Suffolk, through displays which range from early times right through to the present. The collections are housed in one of England's rare surviving Norman houses where the original features are still clearly visible. 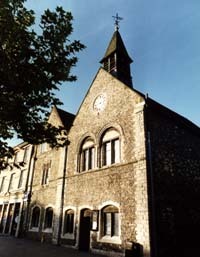 In its long history Moyse's Hall has been used as a gaol, fire station and a railway parcels office, before opening as a museum in 1899. The collections and local history artifacts are complemented by a lively programme of changing exhibitions. Moyse's Hall museum aims to tell the story of Bury St Edmunds from Monastic times onwards. More recent history is interpreted through displays which reveal the rich and sometimes life of a small rural community and chronicle the achievements of its people. Whether you are looking for relics of the great medieval abbey or the relics of the notorious Red Barn Murder, you will find them in Moyse's Hall, whose own story is as rich and varied as the collections which it houses.